I give 100% credit to my dear friend Drew for inspiring this post. Drew and I were catching up last week about our respective lives, careers, and the startup world. We are similar people in that we have a million ideas and suffer from wanting to do everything at once! When we reach our saturation point of options, we each make a 90-day plan and decide to commit to next steps within that 90 days. It could be anything – a home improvement project, planning a trip, taking a new job or founding a startup – just time box it and go for it. 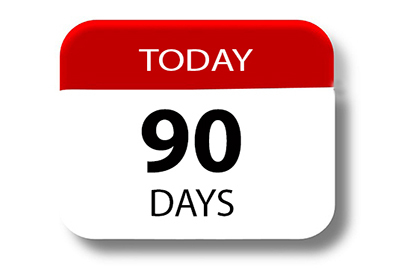 What goals do we think we can reach within 90 days? How much of ourselves can we commit to reach this goal? What will be our successful “go” criteria beyond meeting those goals and timeline? At the end of our first 90 days, what do we imagine the next 90 days or beyond to look like? In an established company setting, this approach could apply to a prototyping phase of a new product or feature, setting up a new human resource program or even raising new capital via a series “x” or IPO. Having a plan that considers the above may help secure budget and/or support of key stakeholders to let you take a risk early on before making a bigger investment such as hiring people, marketing, etc. This approach can also apply to building a company from the ground up. While we didn’t write out our plan as explicitly as I did above, we had many deep conversations throughout the 90-day period that solidified this approach. In the end, we had a successful, mutually agreed upon, “no-go” decision. It was a great learning experience not only in terms of the domain we explored, but also in terms of what each of us wanted out of our next venture. It’s a bit of a cliché to say “trying is succeeding”, but wouldn’t you rather know you tried, with a plan, and understood why you decided not to do something than doing nothing or working without a plan and wondering “what if” or “why did we fail”? When you’re weighing options, take the 90-day approach. Go for it, execute on a plan, and be true to your self and whomever you may partner with to go, or not to go. Have other good examples of 90-day plans that led to go or no-go? Please reply and share!